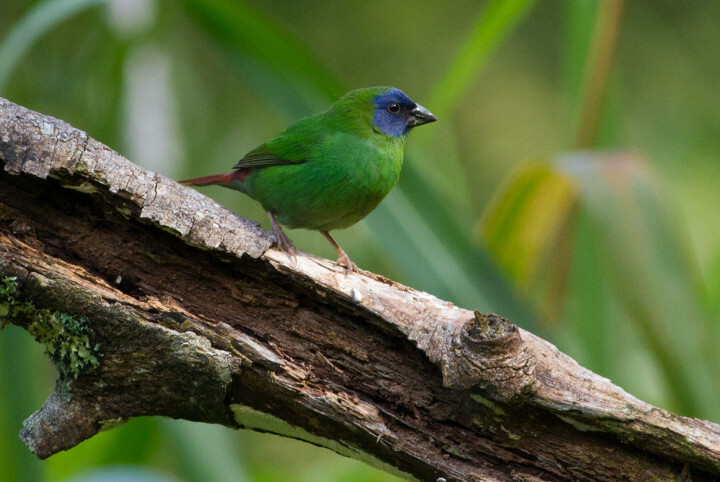 The Blue-faced Parrot Finches are back again! Feeding on the tall grasses close to the second lodge and also around the gate through to our private rainforest. How amazing to watch them from your verandah here at Sweetwater Lodge?! We will be adding a few species to our property bird list to include the much sought after Chestnut-breasted Cuckoo seen last week in the rainforest, the White-eared Monarch and the Black Butcherbird. Also a great delight to one of our guests a pair of Red-necked Crakes seemingly unperturbed by being watched were observed at length feeding just by the rainforest track at the respectable hour of 9:30am, perfect for those photographers looking to catch this bird in good light as opposed to at dusk. Sweetwater offers outstanding birding opportunities without the need to leave the property. Of course for those wishing to venture further afield there are many hotspots within just a few km’s of Sweetwater namely, Abattoir Swamp (across the road from us), Mt Lewis National Park (5km’s to the foot of Mt Lewis), McDougal Road, Wetherby Road, and Mt Molloy to name just a few.